The U.S. commerce department exempted the EU, Canada and Mexico from a 25 percent tariff on steel and 10 percent tariff on aluminum in March. Those exemptions were set to expire in May, but countries were given one more month. U.S. Commerce Secretary Wilbur Ross announced Thursday the exemptions were expiring and the tariffs will go into effect at midnight. The President is still able to cancel or extend those exemptions. 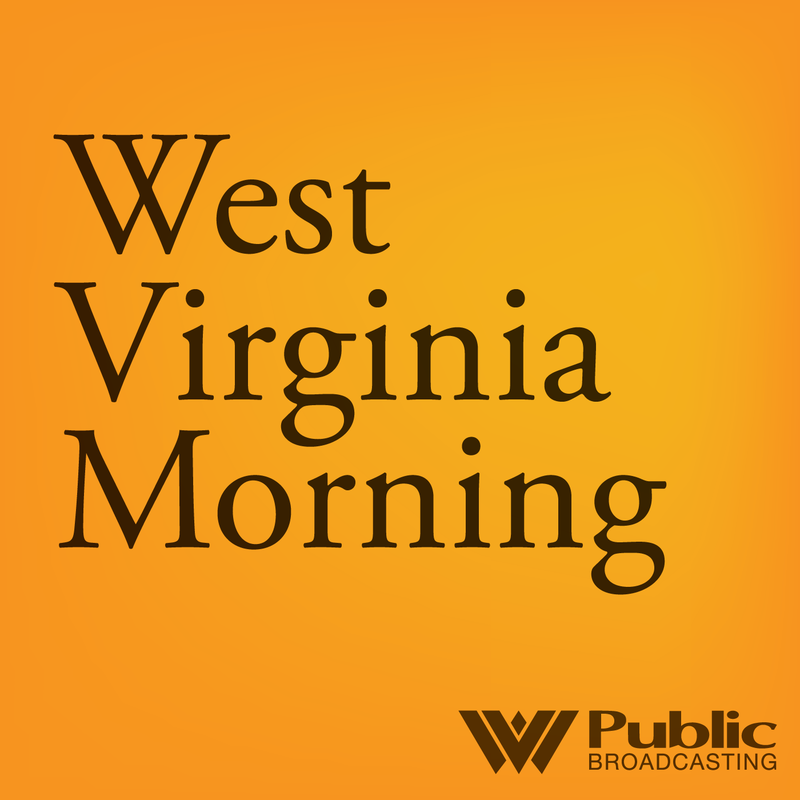 The move has major implications for the Ohio Valley, home to more than 220 steel and aluminum facilities. But other industries in the region could suffer from higher prices on raw materials and punitive tariffs other countries have pledged to impose targeting some of the area’s major export products. The Century Aluminum smelter in Hawesville, Kentucky. The Ohio Valley still provides more than 44,000 jobs in the steel and aluminum industries despite sharp declines over the years due to foreign competition. 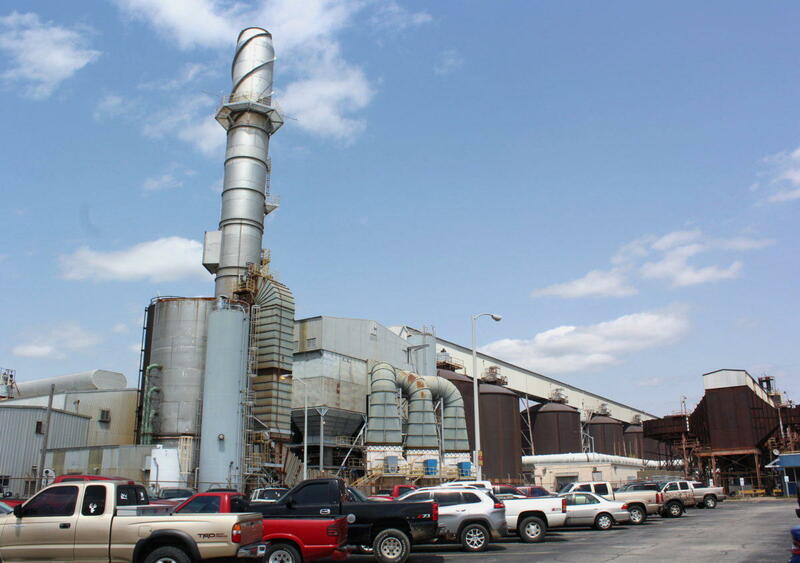 Century Aluminum Executive Vice President Jesse Gary said President Trump’s decision to implement tariffs will increase U.S. production of aluminum by more than 60 percent by the end of the year. “The goal of these tariffs was to restart U.S. production, to protect our national security as a country and to be sure we have some industrial base to service our military, to service our electrical grid and the other uses we have for aluminum in this country,” he said. 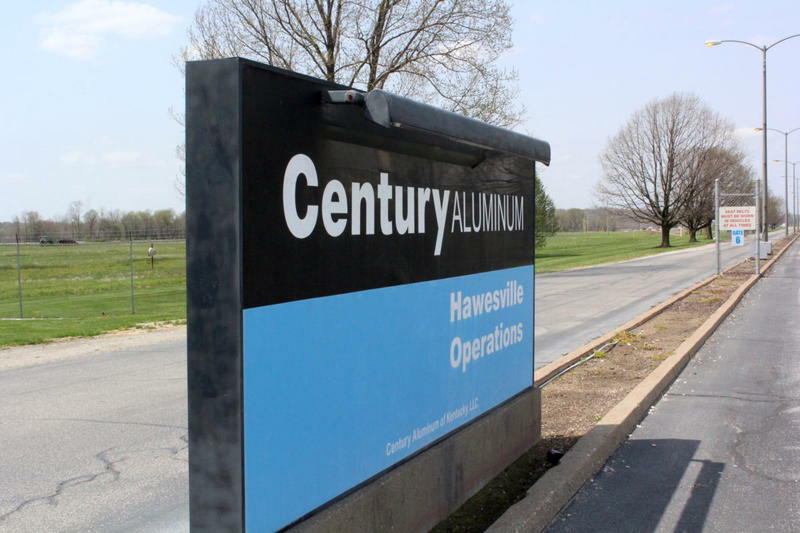 Century Aluminum is in the process of increasing production capacity at its smelter in Hawesville, Kentucky, which had earlier cut production and employment. 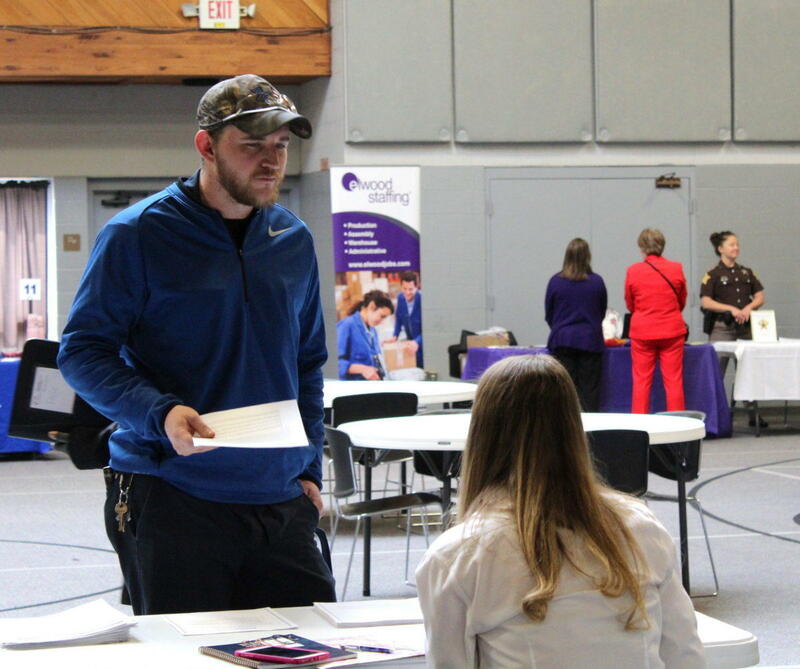 Brady Carwile applying for a job with Century Aluminum. But Erica York, a Policy Analyst with the free-market think tank the Tax Foundation, said tariffs can carry a steep price for other U.S. industries. York said the Bush administration placed tariffs on steel for similar reasons and it ended up hurting workers. “What we found then was that the higher prices of steel caused more American workers to lose their jobs than the number that were employed by the total steel industry itself at that time,” she said. York predicts that while the industries protected by tariffs could see a bump in employment that is unlikely to last. In the long run, she said, the unintended consequences of the higher prices and job losses in other industries outweigh the short term benefits. Another consequence of tariffs is the risk of retaliation by affected trading partners. The European Union has already indicated that retaliatory tariffs are coming. The EU filed a list of target US products, including agricultural goods and bourbon, something important for Senate Majority Leader Mitch McConnell’s home state. There are 32 distillery companies in Kentucky selling to customers around the world, including liquor giant Brown-Forman, where Paul Varga is CEO. “A company like Brown-Forman could be an unfortunate and unintended victim of a policy which in part is aimed at promoting something which Brown-Forman is a stellar example of, committed long term American manufacturing company,” Varga said during a quarterly earnings call in March. 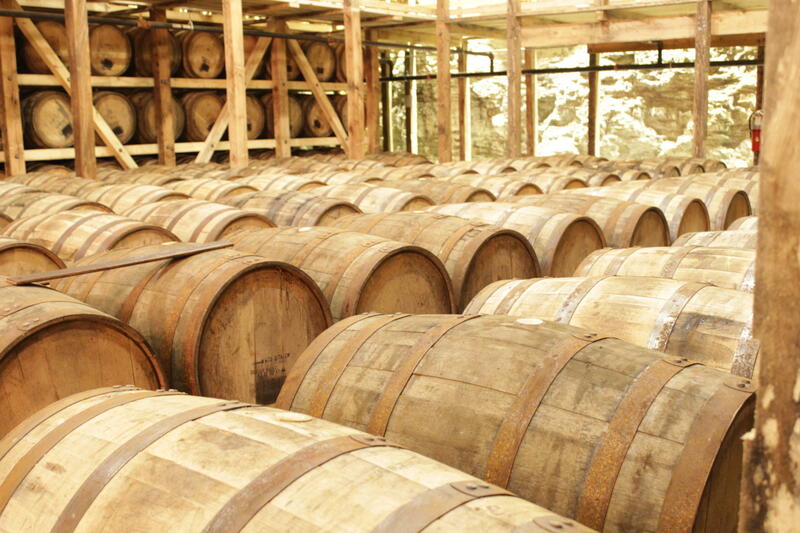 Barrels of bourbon are stored and aged for about 5-7 years. The Kentucky Distillers’ Association said bourbon and distilled spirits accounted for more than $450 million in Kentucky exports last year, and nearly half of that went to European Union countries. Association President Eric Gregory said in a statement that the distillers remain hopeful that continued negotiations will avoid a costly trade war. Gregory added that bourbon is an $8.5 billion industry in Kentucky, generating 17,500 jobs. 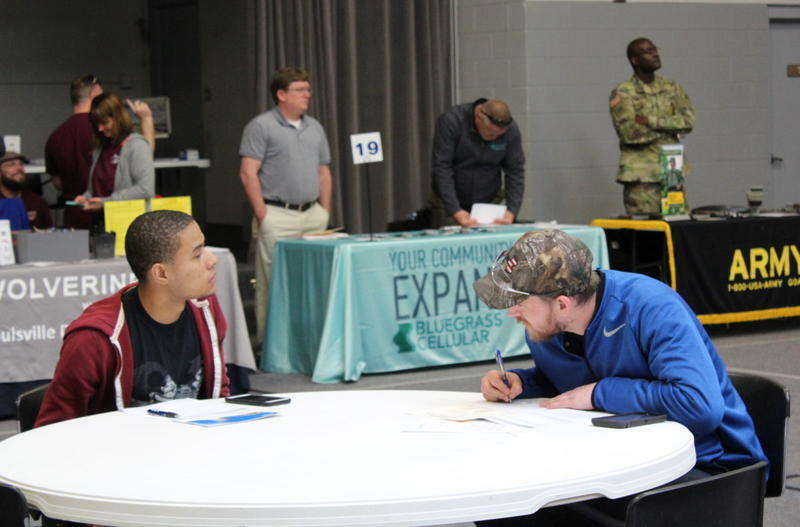 With sunglasses perched atop his camouflage cap, Brady Carwile filled out an application at a job fair in a community center in Elizabethtown, Kentucky. Carwile works at a local auto parts maker but he’s hoping for a maintenance position at Century Aluminum’s Hawesville Smelter.